Dr. Andrew Stern is the founder of Smartfin, an initiative of the arts-based environmental nonprofit Lost Bird. 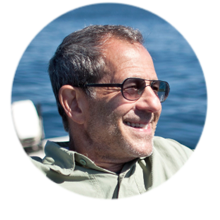 Recently retired from his Neurology practice, Andy now devotes himself fully to raising awareness about our environment. Discovering a need in the scientific community for near-shore ocean data to better understand the effects of climate change on coastal systems, Andy began imagining a data-collecting device deployed on surfboards that would essentially turn surfers into citizen scientists. After enlisting the help of San Diego based engineers, the Smartfin took shape and is currently being tested by researchers at the Scripps Institution of Oceanography.